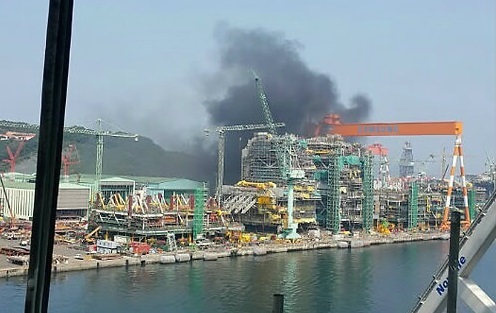 Fire broke out at a Geoje shipyard of Samsung Heavy Industries in the port city in South Korea. The blaze started in Wednesday morning in air conditioning equipment in the shipyard, as Yonhap News Agency reported. The local firefighters responded immediately to the scene of the accident and succeeded to extinguish the flames within less than half an hour. The accident caused partial suspension of operations at Samsung’s Geoje shipyard. Fortunately during the accident there were no injured people and casualties reported. The investigation for the root cause is under investigation. 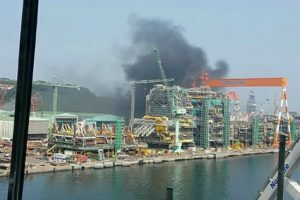 “The blaze, which began in air conditioning equipment in the shipyard at 10:07 a.m., was extinguished around 10:30 a.m.”, said the officials of Samsung Heavy Industries. “We are investigating the exact cause of the fire”, adds the official statement. The Ministry of Employment and Labor ordered Samsung Heavy to partially suspend operations near the site where the fire took place. The shipbuilder needs to improve safety conditions and seek approval from the government to resume operations. Samsung Heavy Industries is one of the largest shipbuilders in the world and one of the “Big Three” shipbuilders of South Korea (including Hyundai and Daewoo). The Geoje Shipyard in particular is the company’s largest shipyard in South Korea, boasts the highest dock turnover rate in the world. Geoje Shipyard is the first shipyard certified by the world’s three highly recognized international standards.